Another vote for this great mood shot!! Love it!! 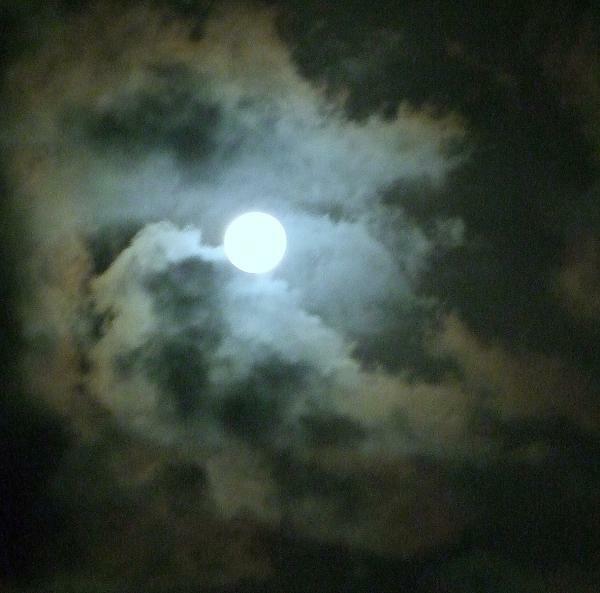 Love the mood and clouds as well as the moon in this!! v/f! This is so mysteriously beautiful!......v/f. Shirley, thank you so much. Have you seen the moon tonight? It was huge. I did not get good pictures - too many clouds and some rain. I will try again tomorrow. Don't want to miss this opportunity. It's hanging big and bold up there again tonight, Jack. Hope there aren't too many clouds. I will try for more drama. Love the moon. Thank you for your comments. Thanks, Joan, and for your v.
Thank you, John. I appreciate how you take the time to critique in a most positive and encouraging way. You are truly appreciated. Thank you, S. Allen, and for your big V.
Thank you so much, Ningning. I have also been enjoying your paintings as well. You have quite a history. Keep painting, enter some contests, join some groups to get your art more widely seen. Allen, how ever did I miss your comment? Thank you for much! Yes, this lends itself to being painted. If i paint it, I'll eventually post it here in my Oil Paintings gallery. I must check your moon and pines too. Mary, many thanks for sharing my happiness of the first sell here. I enjoy your photos very much. This one has a very special effect of composition and texture. It tempts people to paint it. Excellent work!